Received January 21, 2015; Revised June 23, 2015; Accepted June 26, 2015. Indigenous strains of Trichoderma species isolated from rhizosphere soils of Tea gardens of Assam, north eastern state of India were assessed for in vitro antagonism against two important tea fungal pathogens namely Pestalotia theae and Fusarium solani. A potent antagonist against both tea pathogenic fungi, designated as SDRLIN1, was selected and identified as Trichoderma viride. The strain also showed substantial antifungal activity against five standard phytopathogenic fungi. Culture filtrate collected from stationary growth phase of the antagonist demonstrated a significantly higher degree of inhibitory activity against all the test fungi, demonstrating the presence of an optimal blend of extracellular antifungal metabolites. Moreover, quantitative enzyme assay of exponential and stationary culture filtrates revealed that the activity of cellulase, β-1,3-glucanase, pectinase, and amylase was highest in the exponential phase, whereas the activity of proteases and chitinase was noted highest in the stationary phase. Morphological changes such as hyphal swelling and distortion were also observed in the fungal pathogen grown on potato dextrose agar containing stationary phase culture filtrate. Moreover, the antifungal activity of the filtrate was significantly reduced but not entirely after heat or proteinase K treatment, demonstrating substantial role of certain unknown thermostable antifungal compound(s) in the inhibitory activity. Twenty one isolates each of P. theae and F. solani were obtained from Plant Protection Division, Tocklai Experimental Station, Tea Research Association, Jorhat (India). The other five phytopathogenic fungi namely Colletotrichum gloeosporioides MTCC 3439, Colletotrichum lindemuthianum MTCC 8474, Colletotrichum capsici MTCC 3414, Curvularia senegalensis MTCC 8463 and Alternaria alternata MTCC 8459 were procured from Microbial Type Culture Collection Centre (MTCC), Chandigarh, India. All the test fungi were grown on potato dextrose agar (PDA) (Himedia Laboratories Pvt. Ltd., India) plates and incubated at 28 °C for 4?6 days. Stock cultures were maintained on PDA slants and stored at 4°C. Twenty random rhizosphere soil samples were collected from different tea gardens of Assam, north eastern region of India and stored in sterile plastic bags. The soil samples were air dried and isolation was done by the serial dilution technique (Krassilnikov, 1950). Morphologically distinct colonies were picked on the basis of their morphology (Kubicek and Harman, 2002) and purified on PDA. Where r1 was the radial growth of pathogen without Trichoderma sp., r2 represents the radial growth of pathogen with Trichoderma sp. All treatments were conducted in quintuplicates (Ghildiyal and Pandey, 2008). Initial the identification of Trichoderma viride designated as strain SDRLIN1 was done on the basis of its colony and microscopic morphology (Kubicek and Harman, 2002). Further species level identification was confirmed by ITS rDNA sequencing. The 550 bp fragment of ITS rDNA was amplified in a thermo cycler (Bio Rad Model C1000™, USA) by using universal primers of ITS1 (5′ TCC GTA GGT GAA CCTTGC GG 3′) and ITS4 (5′ TCC TCC GCT TAT TGA TAT GC 3′) under the condition: initial denaturation at 95°C for 5 min, 35 repeat cycles of 94°C for 45 sec, 60°C for 30 sec, 72°C for 45 sec and final extension at 72°C for 5 min. The PCR product was directly sequenced by a Sanger’s Dideoxy method on an Applied Biosystems 3730XL sequencer (Biolinkk, New Delhi, India). Homology of ITS rDNA sequence of the isolate was analysed using BLAST program from Genbank database (http:www.ncbi.nlm.gov/BLAST/) and highest matching sequences were downloaded. The ITS rDNA sequence of SDRLIN1 was aligned with these sequences using the program CLUSTALW2 (Thompson et al., 1994). MEGA 6.0 software was used to carry out phylogenetic analyses of the alignment using the Neighbour-Joining statistical method and Jukes and Cantor substitution model (Tamura et al., 2011). In vitro antagonistic activity of the strain SDRLIN1 was evaluated against P. theae (n=21), F. solani (n=21), C. gloeosporioides MTCC 3439, C. lindemuthianum MTCC 8474, C. capsici MTCC 3414, C. senegalensis MTCC 8463 and A. alternata MTCC 8459 by dual culture technique as described previously. All treatments were conducted in quintuplicates. To prepare the cell-free culture filtrate, the antagonist was cultured in potato dextrose broth (Himedia Laboratories Pvt. Ltd., India) and incubated at 28°C on shaker incubator (150 rpm). Incubation period ranging from 8 to 24 days was assessed to determine the effect of incubation period of active metabolite production by SDRLIN1. Cell-free supernatants were collected at 2-days’ intervals by aseptic filtration through Whatman filter paper no. 44 followed by re-filteration through 0.20 μm cellulose acetate syringe filter. The growth inhibitory effects of the extracellular metabolites from culture filtrates were estimated by using the radial growth inhibition assay on PDA containing 50% (v/v) cell free filtrate. Fungal growth inhibition was expressed as the percentage of radial growth inhibition relative to the control (Behzad et al., 2008). The strain SDRLIN1 was grown in potato dextrose broth with continuous shaking (150 rpm) at 28°C for 24 days. Cell-free supernatants were collected from 8 days incubation period, at 2-day intervals as described previously. Proteases activity was determined by Lowry et al. (1951) method using 1% casein in 50 mM phosphate buffer (pH 7.0). The absorbance of liberated tyrosine in the filtrate was measured at 750 nm. Cellulase activity was measured following the method of Miller (1959) with 0.5% pure cellulose (Sigma Co. USA) suspended in 50 mM phosphate buffer (pH 5.0). The absorbance was measured at 540 nm and the amount of reducing sugar released was calculated from standard curve of glucose. The β-1,3-glucanase activity was assayed according to the method of Singh et al. (1999) with slight modifications, using laminarin from Laminaria digitata (Sigma, USA) as substrate. The amount of glucose released by the action of β-1,3-glucanase enzyme was measured by using dinitrosalicylic acid solution (Miller, 1959). Pectinase activity was assayed with pectin as substrate. The reaction was terminated by adding 1 ml 3,5-dinitrosalisylic acid (DNSA) reagent. The absorbance was then measured at 575 nm and the amount of released reducing sugar was estimated (Mandels, 1985). Chitinase activity was quantitatively determined by measuring the reducing end group of N-acetyl glucosamine (NAG) (Imoto, 1971) that degraded from colloidal chitin as substrate. Finally the estimation of chitinase activity was carried out by procedure described by Tikhonov et al. 2002. The amylase activity of the culture filtrate was determined by using 1% starch substrate, prepared freshly in 0.1M phosphate buffer (pH 6.0) as described by Sudharhsan et al. 2007. All the test phytopathogenic fungi namely P. theae, F. solani, C. gloeosporioides MTCC 3439, C. lindemuthianum MTCC 8474, C. capsici MTCC 3414, C. senegalensis MTCC 8463 and A. alternata MTCC 8459 were independently cultured on the surface of microscopic slides covered with thin (5.0-mm-thick) layers of PDA containing 50% (v/v) cell-free culture filtrate of 20 days old culture of the strain SDRLIN1. Simultaneously, each test fungus was also grown on a PDA layer as a control. The inoculated slides were incubated at 28°C for 3 days. The fungal hyphae present on the slides were stained with lactophenol cotton blue dye (Himedia Laboratories Pvt. 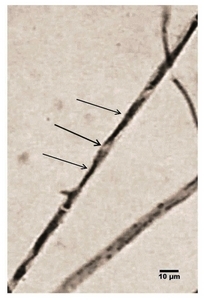 Ltd., India), and subsequent changes in the morphology of young emerging hyphae were observed using a light microscope (40×) (Prapagdee et al., 2008). To assess the stability of the extracellular metabolites, 20 days old culture filtrates of strain SDRLIN1 were either treated with 0.1 mg/ml proteinase K (Thermo Scientific, Lithuania) at 37°C for 60 min or boiled for 45 min. The inhibitory effect of treated culture filtrates on the radial growth of P. theae, F. solani and C. lindemuthianum MTCC 8474 was determined as described above. Mycoparasitism of the SDRLIN1 against test fungal phytopathogens was studied using slide culture method. Inocula from the antagonist and test fungus were placed 1 cm apart from each other on the surface of microscopic slides covered with thin (5.0-mm-thick) layers of PDA. The inoculated slides were incubated at 28°C for 3?5 days. At the end of the incubation period, regions where the hyphae of Trichoderma met the hyphae of the pathogen were observed under a light microscope for the presence of coil formation and penetration structures, or wall disintegration (Matroudi et al., 2009). The means and standard deviations of the inhibition levels, radial growth and activities of proteases, cellulase, β-1,3-glucanase, pectinase, chitinase and amylase were calculated. Data were analysed by one-way analysis of variance (ANOVA) using GraphPad Prism 5. Significant differences (p ≤ 0.05) between the means were determined by unpaired t test and Tukey’s multiple comparison test. Out of the total 49 isolates of T. sp., only 8 of them showed antifungal antagonistic activity in vitro dual plate assay against tea phytopathogenic fungi namely P. theae and F. solani. However, only one isolate designated as SDRLIN1 exhibited the maximum inhibitory activity against both test phytopathogenic fungi (Fig. 1A and 1B). The strain SDRLIN1 was identified as Trichoderma viride (Hypocrea rufa) on the basis of its structural and morphological characteristics (Table 1). The ITS rDNA sequence analysis of the antagonist further confirmed the species identity. The sequence of the strain was submitted to Genbank with the accession number JX960646. The phylogenetic tree obtained by sequence analysis of ITS rDNA of strain SDRLIN1 and of 15 Trichoderma spp. obtained from NCBI, GenBank is represented in Fig. 2. In vitro dual culture assay clearly demonstrated the broad spectrum antifungal activity of the strain SDRLIN1. The radial growth inhibition of isolates of P. theae (n=21) and F. solani (n=21) was ranged from 32% to 71% and 42% to 76% respectively (Table 2). The inhibition activity of the antagonist against other test fungal phytopathogens namely C. capsici MTCC 3414 (65.7%), A. alternata MTCC 8459 (56%), C. senegalensis MTCC 8463 (55.1%), C. lindemuthianum MTCC 8474 (54.7%) and C. gloeosporioides MTCC 3439 (51.1%), was also found significant (Table 3 and Fig. 3). 20 days old cell free culture filtrate of the antagonist SDRLIN1 showed maximum inhibition activity against all the test fungal phytopathogens at 50% (v/v) concentration. The antagonistic activity was increasing in the exponential phase and was noted highest in the stationary phase (Fig. 4 and Fig. 5). The reduction in the radial growth of isolates of P. theae (n=21) and F. solani (n=21) was ranged from 40% to 72.7% and 46.6% to 73.3% respectively at 50% (v/v) concentration of the stationary culture filtrate (Table 2). Similarly 69%, 68.7%, 53.1%, 22.2% and 18.9% reduction of mycelial growth were observed for A. alternata MTCC 8459, C. lindemuthianum MTCC 8474, C. senegalensis MTCC 8463, C. gloeosporioides MTCC 3439 and C. capsici MTCC 3414 respectively (Table 3). The activity of extracellular cellulase, pectinase, β-1,3-glucanase, amylase, proteases and chitinase was determined at different growth phases from 8 days to 24 days at 2 days of interval. There was no cellulose, pectin, casein, laminarin, chitin or related substrate containing in the PD broth. The highest activity of extracellular enzymes namely cellulase (170.82 IU/L), pectinase (168.43 IU/L), β-1,3-glucanase (90.63 IU/L) and amylase (16.51 IU/L) was noted at 8 days of incubation period. The activity of the respective extracellular enzymes decreases gradually in the subsequent incubation periods. 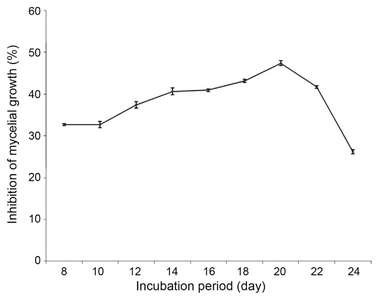 Contrary to this, the activity of proteases (20.61 IU/L) and chitinase (6.91 IU/L) was noted maximum at 20 and 14 days of incubation period respectively followed by subsequent decrease in the later phase of growth (Fig. 6). Light microscope investigation revealed that extracellular metabolites in the culture filtrate of the antagonist produced cellular alterations in hyphal morphology including hyphal distortion, swelling and cytoplasm aggregation of the test phytopathogenic fungus (Fig. 7). The antifungal activity of proteinase K treated culture filtrate of the antagonist against C. lindemuthianum MTCC 8474, F. solani and P.theae was 53.08%, 47% and 33.69% respectively as compared to 68.16%, 59.9% and 62.56% correspondingly with the untreated culture filtrate. However, more reduction in the antifungal activity of heat treated culture filtrate against C. lindemuthianum MTCC 8474 (22.42%), F. solani (35.0%) and P.theae (31.26%) was observed. But either of the treatment does not completely reduced the inhibition property of the 20 days old culture filtrate of the strain SDRLIN1 (Fig. 8). SDRLIN1 showed parasitic behavior against all the test fungal phytopathogens namely P. theae, F. solani, C. gloeosporioides MTCC 3439, C. lindemuthianum MTCC 8474, C. capsici MTCC 3414, C. senegalensis MTCC 8463 and A. alternata MTCC 8459 by encircling, shrinking and ultimately degrading the host hyphae (Fig. 9). Antagonist potential of Trichoderma species against different fungal phytopathogens has been reported by several researchers in the due course of time (Bell et al., 1982; Papavizas, 1985; Elad and Kapat, 1999; El-Katatny et al., 2001; Marco et al., 2003; Sanjay et al., 2008; Indira, 2011). Trichoderma spp. especially T. viride and T. harzianum exhibit substantial variability among strains with respect to their antagonistic activity and host range (Sivan and Chet, 1989). Thus, new strains of the Trichoderma spp. from the rhizospheric vicinity of the host plant, which may exhibit potentially better bio controlling activity against a range of pathogens of the respective host plant, must be explored to have industrially promising strain (s). The study was carried out to screen native 49 strains of Trichoderma spp. from the rhizospheric soils of tea gardens of Assam (northeastern part of India), recognized as world’s largest tea growing region (http://en.wikipedia.org/wiki/Assam_tea), against two economically important fungal pathogens namely P. theae (grey blight disease) and F. solani (dieback disease) of tea plant. 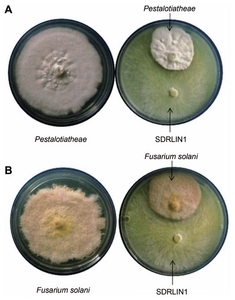 Among the antagonists, the strain designated as SDRLIN1 registered higher antagonistic activity against both tested tea fungal phytopathogens in dual culture method (Fig. 1). The taxonomic identity of the antagonist SDRLIN1 was ascertained by macroscopic and microscopic features (Kubicek and Harman, 2002) and further by ITS sequencing as T. viride. Further screening of the strain SDRLIN1 against different isolates of P. theae (n=21) and F. solani (n=21) revealed wide-ranging antagonism (Table 2). This suggested that different strains of a particular pathogenic fungal species may show variable response in terms of inhibition for a particular antagonist. Therefore as a whole, T. viride strain SDRLIN1 showed 50.51% and 63% (mean percent inhibition value) antagonistic activity against the isolates of P. theae and F. solani respectively. Moreover, the antagonist also showed >50% inhibitory activity against other five tested standard fungal phytopathogens namely C. capsici MTCC 3414, A. alternata MTCC 8459, C. senegalensis MTCC 8463, C. lindemuthianum MTCC 8474 and C. gloeosporioides MTCC 3439 (Table 3). The results of the dual culture assay suggested that the strain SDRLIN1 exhibits broad spectrum antagonistic activity which is quiet substantial in terms of biocontrol perspectives. The efficacy of Trichoderma sp. against a wide range of fungal pathogens is well supported by earlier studies (Xiao-Yan et al., 2006; Zivkovic et al., 2010). The antagonistic activity of Trichoderma against phytopathogenic fungi in dual cultures is attributed to the ability of the former to produce diffusible and volatile metabolites as well as certain extracellular hydrolytic enzymes (El-katany et al., 2001). In the present study each plant fungal pathogen responded differently to the diffusible or volatile metabolites of the strain SDRLIN1 in dual culture which is in accordance with the earlier study of Cooney and Lauren (1998) who reported that T. harzianum produces higher levels of 6-pentyl-α-pyrone (6PAP) in response to specific pathogens, which could be due to direct interaction or recognition and response of the antagonist to presence pathogen, considering the possibility that some pathogens can produce extracellular enzymes, protein or metabolites that lead the antagonist to produce high levels of antifungal metabolites. 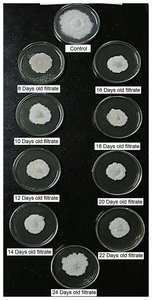 Cell free culture filtrate from different growth phases was used in the present study to demonstrate the possible best optimal stage of the growth period exhibiting optimum concentration of extracellular antifungal metabolite (s) corresponding to highest antagonistic activity of the strain T. viride SDRLIN1. The culture filtrate obtained from the stationary phase (i.e. after 20 days of incubation period) displayed highest inhibition activity against majority of the tested fungal phytopathogens in varied degrees at 50% (v/v) concentration (Table 2 and Table 3). The decrease in the degree of fungal growth inhibition corresponded to the decrease in (v/v) concentration (data not shown). The present study reported that the growth inhibitory effect of culture filtrate increases with the extension of fungal incubation period (Fig. 3). However, previously most of the workers explored 10 days old culture filtrate of Trichoderma species for antagonistic activity against different phytopathogens (Castillo et al., 2011; Perveen and Bokhari, 2012; Mishra, 2010). The results therefore indicated that fungal growth suppression happened due to the presence of optimal concentration of extracellular antifungal metabolites in the 20 days old culture filtrate of the antagonist. Hence, the ideal growth phase of an antagonist corresponding to maximum inhibitory activity against a range of pathogens is very much important for commercial viability in the field of biocontrol. The antagonist showed statistically significant differences (P<0.05) in the inhibitory activity in dual culture and cell free culture filtrate (50% v/v) assay against majority of the tested fungal phytopathogens. The strain SDRLIN1 displayed considerably higher inhibitory activity (P<0.05) against majority of the tested isolates of P. theae pathogen in cell free culture filtrate assay. In contrary, the strain exhibited noticeably higher antagonistic activity (P<0.05) against most of the tested F. solani isolates in dual culture (Table 2). Similarly, out of five tested standard phytopathogenic fungi, C. capsici and C. gloeosporioides were inhibited significantly (P<0.05) in dual culture whereas A. alternate and C. lindemuthianum in cell free culture assay. However, no significant difference in terms of inhibition was noted for C. senegalensis in both methods (Table 3). The higher antagonistic activity of the strain SDRLIN1 recorded against majority of the F. solani strains, C. capsici and C. gloeosporioides in dual culture assay may be attributed to the synergistic effect of diffusible and volatile metabolites as well as certain extracellular hydrolytic enzymes produced by the antagonist or may be due to certain interesting interaction between antagonist and pathogen, inducing the former to either produce some specific antifungal metabolites or overexpression of certain antifungal compound (s). Apart from this, the maximum inhibitory activity displayed by the antagonist in cell free culture assay against most of the P. theae isolates, A. alternate and C. lindemuthianum is solely attributed to the extracellular antifungal metabolites (Sivasithamparam and Ghisalberti, 1998). The present study, therefore demonstrated that a particular antagonist may respond differently against either a strain of a specific pathogen or dissimilar pathogen (s). The earlier workers solely concentrated on demonstrating the in vitro antagonism of Trichoderma species against different pathogens (Dennis and Webster, 1971; Dubey and Suresh, 2006; Shaigan et al, 2008; Siameto et al., 2010; Indira, 2011). However, the current study has revealed that number of strains of a particular pathogen must be taken in account in vitro studies to demonstrate the antagonistic potential of Trichoderma species or of any other potent antagonist so that a range of inhibition can be determined, which is extremely important to validate the efficacy of a certain antagonist against a particular pathogen. The production of extracellular hydrolytic enzymes, apart from other secretory antifungal metabolites, by Trichoderma species and their role in antagonism are very well established in the past. In the present study, investigation was carried out on the effect of incubation period on the production of cellulase, β-1,3-glucanase, pectinase, proteases, amylase and chitinase by T. viride strain SDRLIN1 in terms of their respective IU/ml activity and correlation with the antagonistic activity. The strain displayed highest cellulase, pectinase, β-1,3-glucanase and amylase activities after 8 days of incubation period and, thereafter the activity of respective enzymes decreased. 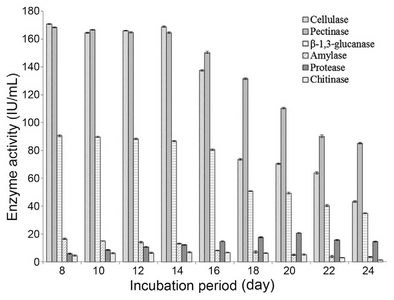 However, the activity of proteases and chitinase was noted maximum at 20 and 14 days of incubation period respectively (Fig. 6). The observation was significant as 20 days old culture filtrate of the antagonist demonstrated highest inhibition activity against the majority of the tested fungal phytopathogens. The study thus revealed that though the concentration of certain mycolytic enzymes like cellulase, pectinase and β-1,3-glucanase except chitinase and proteases was highest at the early growth phase, the antagonistic activity of the strain SDRLIN1 was highest at the stationary phase which comprises of optimum concentration of all hydrolytic enzymes, acting synergistically in the inhibitory activity. The present investigation therefore, not only specified the role of hydrolytic enzymes in aiding biocontrol potentiality of Trichoderma spp. As reported earlier by workers (Elad et al., 1982; Lorio et al., 1994; Pozo et al., 2004 and Kumar, 2010) but also showed that the optimal blend of these hydrolytic enzymes is necessary for significant biocontrol activity against different pathogens. Moreover, the antagonists usually secrete more proteases to suppress the action of pectinase and chitinase enzymes produced by several plant pathogens (Radjacommare et al., 2010). The current study thus further proven it with the antagonistic activity of the 20 days old culture filtrate of Trichoderma strain SDRLIN1 being highest against the plant pathogen (Fig. 4 and Fig. 5). The effects caused by extracellular metabolites of the strain SDRLIN1 on the hyphal morphology of the pathogen were also studied through light microscopy. A greater degree of alteration of hyphal morphology in the form of distortion, swelling and even aggregation of the cytoplasm was noted on PDA amended with 50% (v/v) stationary culture filtrate (Fig. 7). It has been reported that lytic enzymes such as β-1,3-glucanases, chitinases and proteases produced by antagonistic strains are responsible for such changes in the hyphal morphology (Cortes et al., 1998). The observations of this study further highlighted the importance of these lytic enzymes in the antagonistic activity of Trichoderma strain against various pathogens. On the basis of findings from in vitro studies, it is assumed that the combination of extracellular hydrolytic enzymes and secondary antifungal metabolite (s) of antagonist SDRLIN1 are acting synergistically in the inhibition of fungal growth. To recognize whether all components involved in the antagonistic activity of the strain SDRLIN1 are proteinase K and heat sensitive, the 20 days old stationary culture filtrate of the antagonist was treated with proteinase K and heat. The experiments with proteins K and heat treated culture filtrate showed a significant reduction (P<0.05) in the antifungal activity against P. theae, F. solani and C. gloeosporioides compared to the inhibitory activity of the untreated stationary culture filtrate. Moreover, significant differences in the percent growth inhibition of respective test pathogens were also noted between proteinase K and heat treated culture filtrates. However, importantly, none of the treatment had completely reduced the antifungal activity (Fig. 8). Thus, the present study revealed that the antifungal potential of the stationary culture filtrate of the strain SDRLIN1 was largely due to the presence of unknown thermostable as well as thermolabile antifungal compound (s) rather than to solely the presence of hydrolytic enzymes. The species of Trichoderma are known to produce a number of secondary metabolites like trichodermin, trichodermol, harzianum A, harzianolide etc., apart from lytic enzymes that play significant role in the antagonistic activity (Dickinson et al., 1995). Microscopic study of the interaction region between test fungal pathogens with T. viride strain SDRLIN1 showed mycoparasitic behavior of the latter. 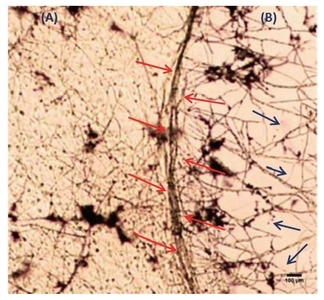 The antagonist grew on the surface of the test pathogens and coiled around their mycelia and later penetrating their cell walls without formation of appersorium like structures (Fig. 9A). The pathogen mycelia, then disintegrated suggesting both mechanical and enzymatic action (Fig. 9B). Mycoparasitism mainly relies on the production of fungal cell wall degrading enzymes (Elad et al., 1998). Earlier several workers have reported the role of chitinolytic and β-1,3-glucanases enzymes in biocontrol by Trichoderma strains. These enzymes function by breaking down the polysaccharides, chitin and glucans that are responsible for the rigidity of fungal cell walls, thereby destroying cell wall integrity limiting the growth of the pathogen (Lorito et al., 1998; Metcalf and Wilson, 2001 and Sharon et al., 2001). Fig. 1. In vitro antifungal activity of the potent Trichoderma antagonist SDRLIN1 against (A) P. theae and (B) F. solani on PDA plates. Fig. 2. 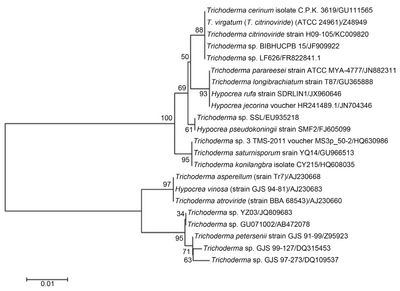 Phylogram based on ITS rDNA region, showing the position of Hypocrea rufa (Trichoderma viride) strain SDRLIN1. The evolutionary history was inferred using Neighbour-Joining method and evolutionary distances were computed using the Maximum Composite Likelihood method and are in the units of the number of base substitutions per site. The analysis involved 22 nucleotide sequences. Fig. 3. 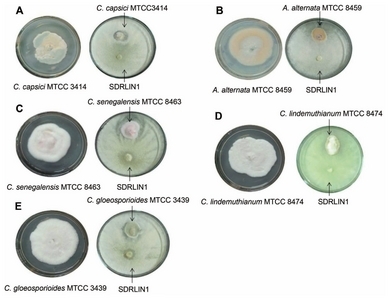 In vitro antifungal activity of SDRLIN1 against (A) C. capsici MTCC 3414, (B) A. alternata MTCC 8459, (C) C. senegalensis MTCC 8463, (D) C. lindemuthianum MTCC 8474 and (E) C. gloeosporioides on PDA plates. Fig. 4. Antifungal activity of cell free culture filtrates of the antagonist SDRLIN1against P. theae isolate. Fig. 5. Effect of culture filtrates of strain SDRLIN1 on radial growth of P. theae. Fig. 6. Activity profile of hydrolytic enzymes secreted by the antagonist SDRLIN1. Fig. 7. Light microscope photography (40×) showing hyphal morphology of 3 days old culture of P. theae on PDA amended with 50% (v/v) culture filterate of Trichoderma strain SDRLIN1. The arrows indicate distortion of hypha. Fig. 8. 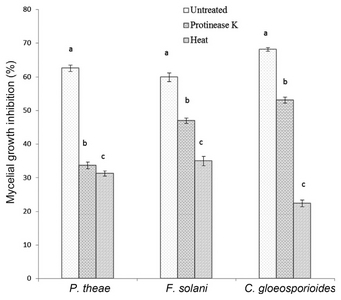 Effects of proteinase K and heat on the antifungal activity of culture filtrates of Trichoderma strain SDRLIN1to phytopathogenic fungi. Fig. 9. Light microscope photograph (10×) (A) showing profuse growth of antagonist (SDRLIN1) and its interaction with the pathogen resulting in barrier formation (indicated by red arrows). (B) Showing scanty growth of pathogen and disintegration of its hyphae (indicated by blue arrows). 4 55.4±1.72 60±2.23 * 57.6±2.39 58±1.581 n.s. 7 42.4±2.88 55.3±1.64 * 55.8±2.44 56.4±1.14 n.s. 19 66±1.87 56.2±1.78 * 58.9±1.51 59.2±2.58 n.s. Curvularia senegalensis (MTCC 8463) 55.1±1.74 53.1±2.30 n.s. Baby, UI, and Chandramouli, B (1996). Biological antagonism of Trichoderma and Gliocladium sp. against certain primary root pathogens of tea. J Plant Crops. 24, 249-255. Baby, UI, and Sanjay, R (2006). Seasonal incidence and economic importance of grey blight disease of tea. J Plant Crops. , 3466-67. Behzad, H, Mousa, T, Mohammad, RM, and Mahdi, D (2008). Biological potential of some Iranian Trichoderma isolates in the control of soil borne plant pathogenic fungi. Afr J Biotechnol. 7, 967-972. Bell, DK, Wells, HD, and Markham, CR (1982). In vitro antagonism of Trichoderma spp. against six fungal plant pathogens. Phytopathology. 72, 379-382. Borthakur, BK, and Dutta, PK 1992. Prospect of biocontrol of tea diseases in North East India., Proceedings of the 31st Toklai Conference, pp.163-168. Borthakur, BK (2011). Recent approach of Tocklai to plant protection in tea in north east India. Sci Cult. 77, 381-384. Campbell, R (1989). Biological control of microbial plant pathogens. U.K: Cambridge University Press, pp. 9-34. Castillo, FDH, Padilla, AMB, Morales, GG, Siller, MC, Herrera, RR, Gonzales, CNA, and Reyes, FC (2011). In vitro antagonist action of Trichoderma strains against Sclerotinia sclerotiorum and Sclerotium cepivorum. Am J Agri Biol Sci. 6, 410-417. Chandramouli, MR, and Baby, UI (2002). Control of thorny stem blight disease of tea with fungicides and biocontrol agents. Proceedings of Plantation Crops and Development in the New Millennium, Rethium, P, Khan, HH, Reddy, VM, Mandal, KP, and Suresh, K, ed. Kochi, India: Coconut Development Board, pp. 531-534. Cherif, SS, and Benhamou, CS (1990). Cytochemical aspects of chitin breakdown during the parasitic action of a Trichoderma spp. on Fusarium oxysporum f. sp. radicans-lycopersici. Phytopathology. 80, 1406-1414. Cooney, JM, and Louren, DR (1998). Trichoderma/pathogen interactions: Measurement of antagonistic chemicals produced at the antagonist/pathogen interface using a tubular bioassay. Lett Appl Microbiol. 27, 283-286. Cook, RJ, and Baker, KF (1983). The nature and practice of biological control of plant pathogens. St. Paul, MN: APS. Cortes, C, Gutierrez, A, Olmedo, V, Inbar, J, and Chet, I (1998). The expression of genes involved in parasitism by Trichoderma harzianum is triggered by a diffusible factor. Mol Gen Genet. 260, 218-225. Dennis, C, and Webster, J (1971). Antagonistic properties of species groups of Trichoderma. I. Production of nonvolatile antibiotics. Trans Br Mycol Soc. 57, 25-39. Dickinson, JM, Hanson, JR, and Truneh, A (1995). Metabolites of some biological control agents. Pestic Sci. 44, 389-393. Dubey, SC, and Suresh, M (2006). Randomly Amplified Polymorphic DNA Markers for Trichoderma species and Antagonism against Fusarium oxysporum f. sp. ciceris causing chickenpea wilt. J Phytopathol. 154, 663-669. Elad, Y, Chet, I, and Henis, Y (1982). Degradation of plant pathogenic fungi by Trichoderma harzianum. Can J Microbiol. 28, 719-725. Elad, Y, Rav David, D, Levi, T, Kapat, A, Kirshner, B, Guvrin, E, and Levine, A (1998). Trichoderma harzianum T39 mechanisms of biocontrol of foliar pathogens. Modern fungicides and antifungal compounds, Lyr, H, Russel, PE, Dehne, HW, and Sisler, HD, ed: H. Hampshire UK: intercept Ltd, pp. 459-467. Elad, Y, and Kapat, A (1999). The role of Trichoderma harzianium protease in the biocontrol of Botrytis cinerea. Eur J Plant Pathol. 105, 177-189. El-Katatny, MH, Gudelj, M, Robra, KH, Elnaghy, MA, and G?bitz, GM (2001). Characterization of a chitinase and an endo-β-1,3-glucanase from Trichoderma harzianum Rifai T24 involved in control of the phytopathogen Sclerotium rolfsii. Appl Microbiol Biotechnol. 56, 137-143. Ghildiyal, A, and Pandey, A (2008). Isolation of cold tolerant strains of Trichoderma sp. from glacial sites of Indian Himalayan region. Res J Microbiol. 3, 559-564. Harman, GE, Howell, CR, Viterbo, A, Chet, I, and Lorito, M (2004). Trichoderma species-opportunistic, avirulent plant symbionts, A review. Nat Rev Microbiol. 2, 43-56. Hazarika, M, and Muraleedharan, N (2011). Tea in India: Overveiw. Two and a Bud. 58, 3-9. Imoto, T, and Yagisthia, K (2002). A simple activity measurement of lysozyme. Agri Biol Chem. 35, 1154-1156. Indra, Th, and Kamala, S (2011). Evaluation of indigenous Trichoderma isolates from Manipur as biocontrol agent against Pythium aphanidermatum on common beans. 3 Biotech. 1, 217-215. Johnson, DA, and Atallah, ZK (2006). Timing fungicide applications for managing Sclerotinia stem rot of potato. Plant Dis. 90, 755-758. Krassilnikov, NA (1950). Antagonistic Actinomycetes and Antibiotic substances. Moscow: Academic press of the USSR. Kubicek, CP, and Harman, GE (1998). Trichoderma and Gliocladium. Vol. 1. Basic Biology, Taxonomy and Genetics. London: Taylor & Erancis. Kumar, K, Amaresan, N, Bhagat, S, Madhuri, K, and Srivastava, RC (2012). Isolation and characterization of Trichoderma spp. for antagonistic activity against Root rot and foliar pathogens. Indian J Microbiol. 52, 137-144. Lorito, M, Hayes, CK, Di Pietro, A, Woo, SL, and Harman, GE (1994). Purification, characterization, and synergistic activity of a glucan-, β-1,3-glucosidase and a Nacetyl-, β-glucosaminidase from Trichoderma harzianum. Phytopathology. 84, 398-405. Lorito, M, Fernandez, IG, Colucci, G, Harman, GE, Pintor-Toro, JA, and Filippone, E (1998). Genes from mycoparasitic fungi as a source for improving plant resistance to fungal pathogens. Pro Natl Acad Sci USA. 95, 7860-7865. Lowy, OH, Rosebrough, NJ, Farr, AL, and Randell, RJ (1951). Protein measurement with the folin phenol reagent. J Biol Chem. 193, 265-275. Mandels, M (1985). Applications of cellulases. Biochem Sco Trans. 13, 414-416. Marco, JLD, Valadares-Inglis, MC, and Felix, CR (2003). Production of hydrolytic enzymes by Trichoderma isolates with antagonistic activity against Crinipellis perniciosa the causal agent of witches broom of cocoa. Braz J Microbiol. 34, 33-38. Matroudi, S, Zamani, MR, and Motallebin, M (2009). Antagonistic effect of three species of Trichoderma sp. on Sclerotinia sclerotiorum, the causal agent of canola stem rot. Egyptian J Biol. 11, 37-44. Mendez-vilas, A (2010). A review on contributions presented at the BioMicroWorld2009 Conference. Am J Agric Biol Sci. 5, 486-487. Metcalf, DD, and Wilson, OG (2001). The process of antagonism of Sclerotium ceoivorum in white rot affected onion roots by Trichoderma koningii. Plant Pathol. 50, 249-257. Miller, GL (1959). Use of dinitrosalicylic acid reagent for determination of reducing sugar. Analytical Chem. 31, 426-428. Mishra, VK (2010). In vitro antagonism of Trichoderma species against Pythium aphanidermatum. J Phytol. 2, 28-35. Muraleedharan, N, and Chen, ZM (1997). Pest and diseases of tea and their management. J Plant Crops. 25, 15-43. Papavizas, GC (1985). Trichoderma and Gliocladium biology, ecology and potential for biocontrol. Annu Rev Phytopathol. 23, 23-54. Perveen, K, and Bokhari, NA (2012). Antagonistic activity of Trichoderma harzianum and Trichoderma viride isolated from soil of date palm field against Fusarium oxysporum. African J Microbiol Res. 6, 3348-3353. Ponmurugan, P, Baby, UI, and Rajkumar, R (2007). Growth, photosynthetic and biochemical responses of tea cultivers infected with various diseases. Photosynthetica. 45, 143-146. Pozo, MJ, Baek, JM, Garcia, JM, and Kenerley, CM (2004). Functional analysis of tvsp1, a serine protease-encoding gene in the biocontrol agent Trichoderma virens. Fungal Genet Biol. 41, 336-348. Prapagdee, B, Kuekulvong, C, and Mongkolsuk, S (2008). Antifungal potential of extracellular metabolites produced by Streptomyces hygroscopicus against phytopathogenic fungi. Int J Biol Sci. 4, 330-337. Radjacommare, R, Venkatesan, S, and Samiyappan, R (2010). Biological control of phytopathogenic fungi of vanilla through lytic action of Trichoderma spp. and Pseudomonas fluorescens. Arch Phytopathology Plant Protect. 43, 1-17. Sanjay, R, and Baby, UI (2005). Grey blight diseases in tea. Planters Chron. 101, 4-9. Sanjay, R, Ponmurgan, P, and Baby, UI (2008). Evaluation of fungicides and biocontrol agents against grey blight disease of tea in the field. Crop Prot. 27, 689-694. Shaigan, S, Seraji, A, and Moghaddam, SAM (2008). Identification and investigation on antagonistic effect of Trichoderma spp. on tea seedlings white foot and root rot (Sclerotium rolffsi Sacc.) in vitro condition. Pakistan J Biol Sci. 11, 3246-2350. Sharon, E, Bar-Eyai, M, Chet, I, Hewrra-Estrella, A, Klelfeld, O, and Spiegal, Y (2001). Biological control of the root ?knot nematode Meloidogyne javanica by Trichoderma harzianum. Phytopathology. 91, 687-693. Siameto, EN, Okoth, S, Amugune, NO, and Chege, NC (2010). Antagonism of Trichoderma harzianum isolates on soil borne plant pathogenic fungi from Embu District, Kenya. J Yeast Fungal Res. 1, 47-54. Singh, PP, Shin, YC, Park, CS, and Chung, YR (1999). Biological control of Fusarium wilt of cucumber by chintinolytic bacteria. Phytopathology. 89, 92-99. Sivan, CJ, and Chet, I (1989). Degradation of fungal cell walls by lytic enzymes of Trichoderma harzianum. J Gene Microbiol. 135, 675-682. Sivasithamparam, K, and Ghisalberti, EL (1998). Secondary Metabolism in Trichoderma and Gliocladium. Trichoderma and Gliocladium Basic Biology, Taxonomy and Genetics, Kubicek, CP, Harman, GE, and Ondik, KL, ed: Taylor and Francis Inc, pp. 139-191. Sudharsan, S, Senthilkumar, S, and Ranjith, K (2007). Physical and nutrition factors affecting the production of amylase from species of bacillus isolated from spoiled food waste. Afr J Biot. 6, 430-435. Tamura, K, Peterson, D, Peterson, N, Stecher, G, Nei, M, and Kumar, S (2011). MEGA5: Molecular evolutionary genetics analysis using maximum parsimony methods. Mol Biol Evol. 28, 2731-2739. Tikhonov Vladimir, E, Lopez-Llorca, Luis V, Salinas, J, and Jansson, Hans-B?rje (2002). Purification and characterization of chitinases from the nematophagous fungi Verticillium chylamydosporium and V. suchlassporium. Fungal Gent Biol. 35, 67-68. Thompson, JD, Higgins, DG, and Gibson, TJ (1994). CLUSTAL W: Improving the sensitivity of progressive multiple sequence alignment through sequence weighting, position-specific gap penalties and weight matrix choice. Nucleic Acids Res. 22, 4673-4680. Valencia, GB, Vargas, VH, Soto, JNU, Jimenez, NN, and Corral, JH (2011). Trichoderma sp native from chili region of Poanas, Durango, Mexico antagonist against phytopathogen fungi. Am J Agric Biol Sci. , 185-188. Venkataram, CS (1983). Pathogen and pests of tea. Exotic plant Quarantine Pests and procedures for introduction of Plant Materials. Coonoor, India: UPASI Scientific Department, pp. 117-144. Xiao-Yan, S, Qing-Tao, S, Shutao, X, Xiu-lan, C, Cai-Yun, S, and Yu-Zhong, Z (2006). Broad-spectrum antimicrobial activity and high stability of Trochokonins from Trichoderma koningii SMF2 against plant pathogens against plant pathogens. FEMS Microbial LeM. 260, 119-125. Zivkovic, S, Stojanovic, S, Ivanovic, Z, Gavrilovic, V, Popovic, T, and Balaz, J (2010). Screening of antagonistic activity of microorganism against Colletotrichum aculatum and Colletotrichum gloeosporoides. Arch Biol Sci Belgrade. 62, 611-623.